Veronica Lugo was born in Mexicali, Baja California and migrated to Yuma, Arizona, when she was three years old. Growing up in small town near the border strengthened her bicultural roots. 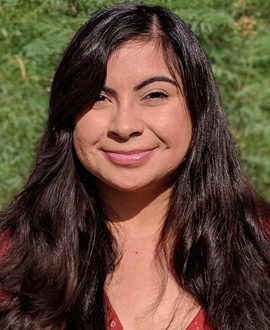 Veronica will soon obtain her Bachelor of Science in Public Health with a minor in Spanish from the University of Arizona. Later, she will pursue a Master’s in Public Health with a contraction in Industrial Hygiene to improve the occupational conditions within migrant field workers, along with other occupational health risks. Ms. Lugo is passionate about serving her community. She volunteers with a mobile clinic that provides underrepresented Latinos in Pima County with free medical screenings. She is a member of LULAC Council #1212 and also volunteered at Northwest Medical Center, Yuma Regional Medical Hospital, Pima County Health Department, and Yuma Health Department. She is involved with a research project at the University of Arizona and has earned the title of Ronald E. McNair Achievement Program Scholar. She is the Project Associate for the STAND Youth Coalition Development Project. STAND mobilizes and empowers youth to organize and take an active role in their communities to reduce the use of Tobacco. In her role, Veronica assists in developing youth activities for regional trainings and planning for summits and conferences. Ms. Lugo conducts research related to emerging issues, marketing to disparate populations, and other policy matters. Veronica supports the technical assistance and training in the counties of Cochise, Graham, Greenlee, Santa Cruz, Yavapai, and Yuma. Her has past experience with STAND as a high school youth positions her well for this role and brings strong perspective.